Yarn: Dale of Norway Lerke, colour 5063, maybe 8 skeins. Or 9? Needles: not sure, might have been 3.5 mm?? See? Without blogging I completely loose track of what I’m doing. There is a lot of catching up to do, although it won’t be a significant loss to mankind if some projects slip under the blog radar, accidentally or not. Don’t let the greeneries fool you, the shots have been in my camera since July or so. Feels like a different world. I’m glad to report I finished the shawl from two posts ago, and that it is a nice pattern even if the start (cast on for the outer edge, you have to ba able to count to fivehundredandsomething) is rather intimidating. Once the lace pattern is established it is a straight forward knit. And a Big Knit! The shawl is huge and blocked even bigger but drapes wonderfully. It wasn’t until the 7th skein or so that the rows actually felt shorter. I really like the style of the Faroese shawls and would love one for myself as I often throw a shawl over my shoulders when the office is chilly. 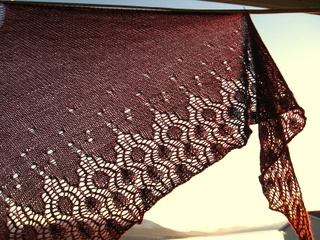 I have my eyes on the Faroese Shawl from a Gathering of Lace. One day.. 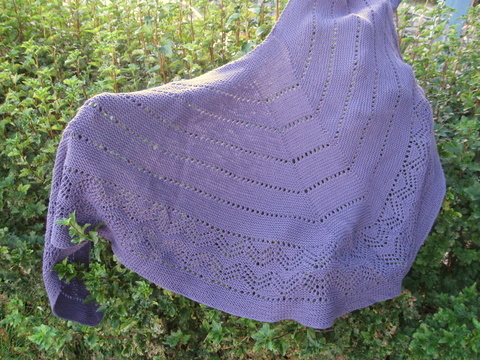 The shawl was a gift to a friend when she had her first child. A shawl for mama, a blanket for baby. 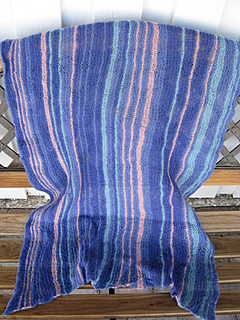 My standard stripey baby blanket in 150 g 2ply merino, cast on 150-170 sts on 6 mm needles and knit until the yarn is out. I had a little accident with this ine, I wanted to full it just a bit. I should know from previous experience that fulling in the washing machine is no exact science, and it came out uneven and sticking to itself in soe areas. Luckily this was one of the rare cases where a good soak in conditioner and a severe block fixed most of it, and the recipient clearly didn’t have to worry about putting a handknit through wash and use! I wasn’t intending to make a bedspread either but think I’m on good way there. 5 balls of Dalegarn Lerke got me through the bottom border of the Faeroese shawl. I’m now at ball eight and still can’t stretch out all the stitches on my 100 cm needle. I think this will grow a lot in the blocking too, the yarn being half cotton. 1. Faroese shawls are pretty (that is a fact in my world). 2. They are knit from the outer edge and require casting on plus/minus half a thousand stitches. 3. The first ball of yarn does not take a knitter very far. I’ve had this yarn in my stash for a while, not knowing what to do with it. As much as I love the gradual colour changes, it is a challenge finding a pattern that works with them. When I stumbled upon this stole on Ravelry I knew it was the perfect match. Those Ravelry hours had to pay off sooner or later. The pattern is for sale online via Vogue’s webpage, but you can only make a purchase there if yo have an American street adress?! Someone has missed out on the main point of online shopping I think…and again Ravelry rescued me. Thank you knitters for being so helpful! My version is a more rustic one than the original, the Evilla yarn is not a supersoft and fuzzy one, but a sproingy wool that still smells of sheep and softens your hands with lanolin during knitting. The stole is light enough to wear with a dress, perfec tas a shawl/lap blanket in chilly meeting rooms and auditoriums, and not too fragile to wrap around my neck and cover my face in a blizzard. Didn’t think I was a stole person, turns out I was just waiting for The Right One. The sun has been back for a while now and today gave us a break from the really really cold weather we’ve had lately. When walking along the shore, closing your eyes and feeling the warmth you can almost fool yourself to believe that spring is just around the corner. That would be a fool’s hope. Believe it or not, but I actually have an FO pile. Not as big as my UFO pile, but still. These days the bottleneck is actually the photographing. Curling up with a book or some knitting has been a lot more tempting lately than standing outside with freezing fingers trying to get some good photos of knits in the snow. 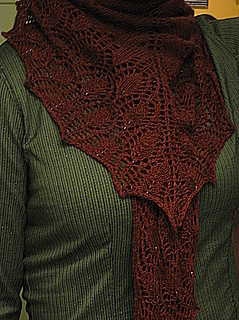 I suddenly remembered this book because I now have another favourite with almost the same name, my new Seraphim shawl! You can tell it is a favourite cause when this picture was taken I had worn it enough for the scalloped edge to need a reblock.. I added beads to the pattern section using the crochet hook method as I went along. The beads are really small and not visible at the first glance, but I think they add a little extra without much bling. The beads are actually a dark purple, a leftover from one of my first blog entries, the Odessa wristwarmers. But together with the deep burgundy yarn you can’t really tell any difference, and I think red beads would stand out much more, which was not what I wanted. This colour thing never stops to confuse me…! I cannot say enough good things about this yarn! It is amazing to knit with, blocks like a dream, keeps the shape and shows patterns well, gives a fabric that is light and warm and drapes nicely, and comes at a good price. And a little goes a long way, I had 4 skeins but only used 2 and 1/3 so there is plenty left for a scarf or something else. 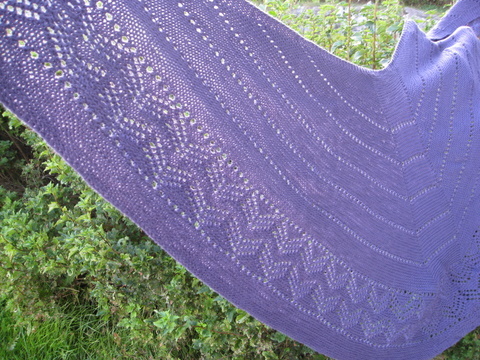 The only thing I wish for is more available colours, but I have already bought some in silver grey for another shawl. Since I’m not the dramatic drapey type, at least not most days, I usually wear my shawls tucked around my neck. Then I can get away with wearing something nice and handmade without dressing up like a Victorian lady. A bib is probably more my style..
Coming up next: more book reports. Knitting book reports! My knitting goes in phases. Two or three times a year I manage to complete the cycle, only to again throw myself head first into a new round. 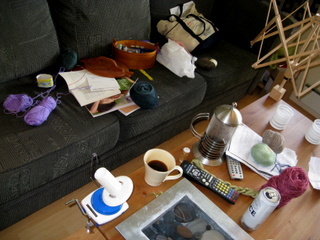 The start usually leaves my living room looking like above for a few days, a warning sign by itself. During this phase all books, pattern files, stash yarns, websites and inner brain storage unite to form a *ahem* optimistic number of projects, few of which manage it past the first rows before they are ripped or put aside for something new. But all I really want is to one or two, or well, a few, nice established projects that I can just pick up and knit on. 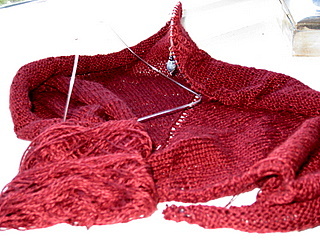 Not having a good knitting project is a nightmare, and it takes time to get to know a new project. So as you see, the initial rounds often take place over a coffee or a beer to break the ice. In an attempt to justify all my book buys (and more are on the way, I am waiting for my catch from the Interweave Hurt book sale) I actually cast on a pattern from one of them, the classic EZ baby sweater on two needles. An easy knit from what I’ve heard but after messing up the lace pattern and ripping back twice I’ve decided to wait and see if the recipient is of the kind likely to be dressed up in purple lace. Not being able to work a simple lace repeat on the baby sweater should probably have stopped me from starting these but they’ve been on my mind since I first saw them: Ironwork Socks from Kelp Knits. It doesn’t look like much now but I have faith that they will block nicely to show the pattern in all its glory. The yarn is a new deliverance from A Piece of Vermont, handdyed merino/bamboo/nylon in an amazing grey tone named Darkness Falls. You know I’m a sucker for grey. Throw in a few hints of brown, lavender and purple and I’m sold. It is such a subtle nearly-solid and impossible to take a photo to make it justice. The pattern is…challenging and amazing. Why the stitch that was a purl stitch on the last row should be a ktbl now and a plain k the next row again is beyond me but wow is this a study in stitch direction and definition. There are some serious cable and lace action going on at the same time but I’ve figured out where to look for the yarnovers I miss all the time. 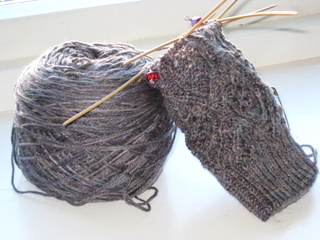 I have now placed markers and am ready to start the heel chart. 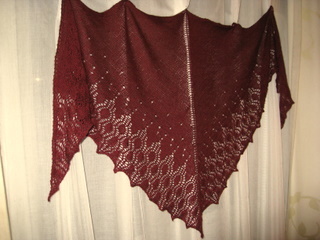 The other project that survived into a WIP is yet another amazing yarn, Little Knits Indie II lace colour Burgundy. While the Ironwork socks demand my full focus and attention, this yarn will become the Seraphim shawl, where the upper portion is just stockinette. Laceweight TV-knitting. Yum. There are more WIPs in shelves and corners around here and the next stage in my knitting cycle is to work on all of them at the same time, not making progress on any. I’m trying to break the spiral here, I’ll never be one of those who only have one project at the time. But a three-project knitter maybe? Yarn: Evilla Artyarn 6/2 colour Denim, 185 g, and PT2 colour 06, 2 balls (100 g). About 250 blue and grey beads, randomly placed along edge. Breast cancer has somehow become the knitblogging disease. We read about it, raise money and share stories. There are devoted pattern pages like Knitty Breast cancer issue and Headhuggers. I’m sure the knitblogging community have most diseases out there represented, but at least this is one that we talk about and work actively against. Still, it is like a punch in the face when it suddenly hits someone you know. There is just no way to be prepared. I picked up this yarn for no real reason other than liking it, and had no plans for it. Later that day I was told that a friend of mine had cancer. There is just so little one can do. 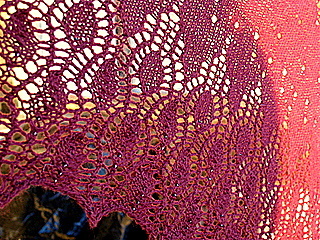 I cast on for a shawl. 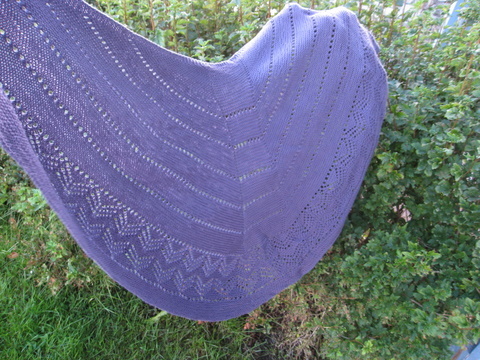 I wanted the shawl to be warm, sturdy and snuggly but good-looking at the same time. Comforting waves. Not blue, not grey, not purple but shifting with the light. With little treasures hidden deep down. In many years from now I hope so see this shawl worn out, and I hope I can knit a new one for my friend. And I want to thank Knitty, Virtuella, Oktober Rosa and everyone else who is continuously working to fight this terrible disease.